"My friend has a laptop with an operating system Windows Vista. He placed a password "libra" and to find out that the system doesn't accept it as its admin password. I tried using capitalized LIBRA and some probability measures but it's just so difficult. I think he pressed something else while typing and retyping the password coincidentally. So, how do we unlock the password?" This question was posted by David in answers.yahoo.com 4 years ago. It reveals that forgetting Vista password is not only a common issue in today, but also has been a thing troubling many people in the past 4 to 5 years. So, suppose if you were David, how would you solve the Vista password forgotten problem? If no clues yet, no worry, this article will help you. Follow the instructions mentioned below and you will be able to recover locked Vista password once you forgot it. 1. Unlock Windows Vista admin password with a super Administrator account. Step1: Start your locked computer and press Ctrl+Alt+Delete keys twice when you see Windows Welcome/Login screen. Step2: When the Classic Login box, type Administrator in username box and leave its password box blank. Then hit "Enter" key. Step3: Now you can smoothly log on to your locked computer again and then change the forgotten Windows Vista password from "Start->Control Panel->User Accounts" easily. 2. Unlock Vista password with Windows Password Key Professional. Step1: Download, install and run this Windows Password Key Professional on a working PC. 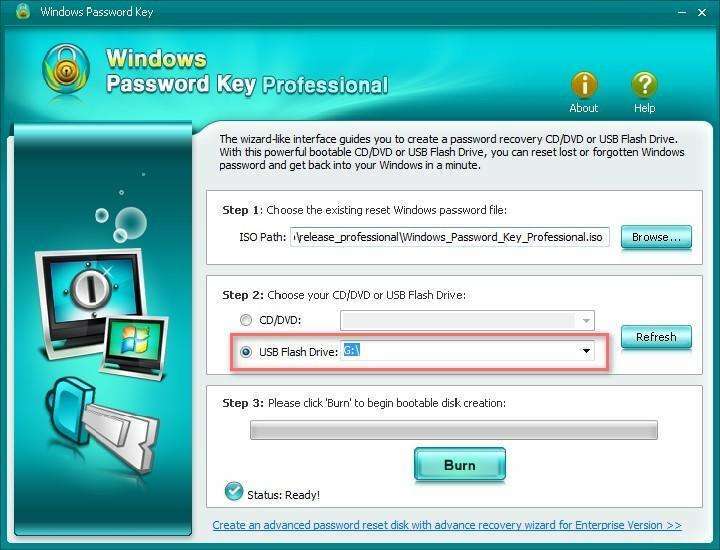 Step2: Prepare for a blank and writable CD/DVD/USB Flash Drive and next insert it to the PC for the purpose of burning the Windows_Password_Key_Professional.iso image file to it and making it as a Windows password reset disk. Step3: Insert the created password reset disk to the target PC and set the PC boot from CD/DVD or USB. Step4: Start to reset the forgotten Windows Vista password with the password reset disk in less than 3 clicks of button. That's all for how to unlock Vista login password. Have you got it? Do remember: Next time when you forgot password for your PC, do not reinstall system!